This day did not start off well! Susan woke up at 3 AM with nausea and suffered the effects of food poisoning for 5 hours while Mark slept through the whole thing. He couldn’t have helped much, anyway. The Costco version of Immodium and some Indian anti-nausea meds helped! We had our own driver for this whole India adventure; this gave us the flexibility to put off leaving Delhi for Agra until 11:30 AM while Susan recovered a bit. The smog was so bad it obscured some of the Taj Mahal. I wondered if Corel has a smog cleaning tool for photo editing? 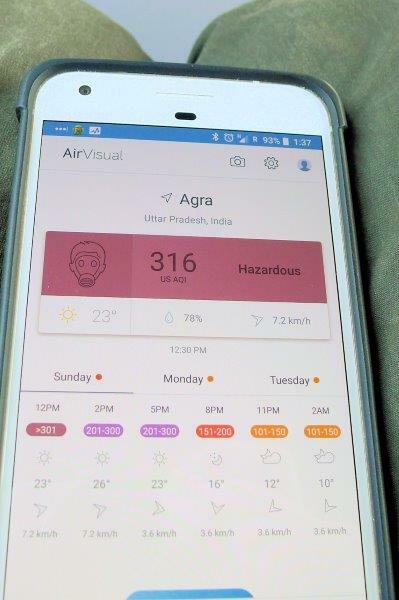 The air quality was Hazardous as we drove to Agra on the freeway. After arriving in Agra and meeting our guide at the hotel, we told him we’d pass on any tours today and meet him at 8 tomorrow morning for the Taj. 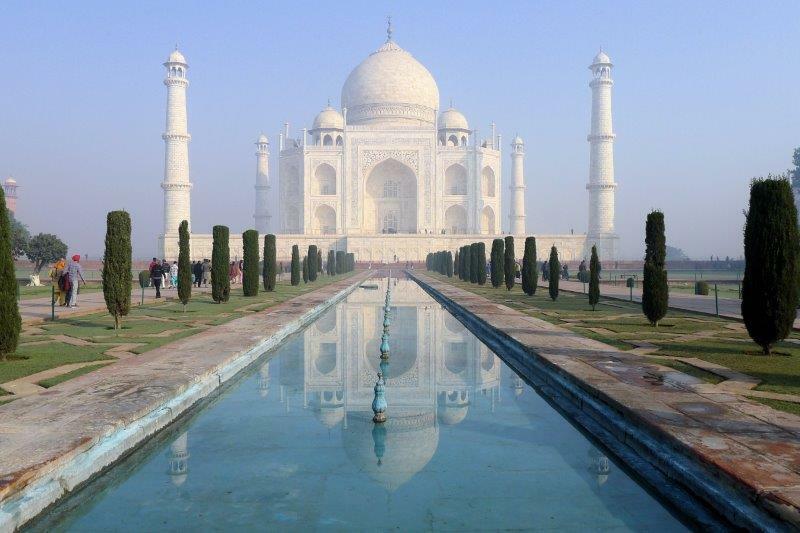 The Taj Mahal was built as a love story – you can find the story here – and the building is beautiful in every way you’ve heard described. We lucked out because the cleaning of the Taj has just been completed and the scaffolding was gone! They still have to clean the dome but that’s a project for another year. 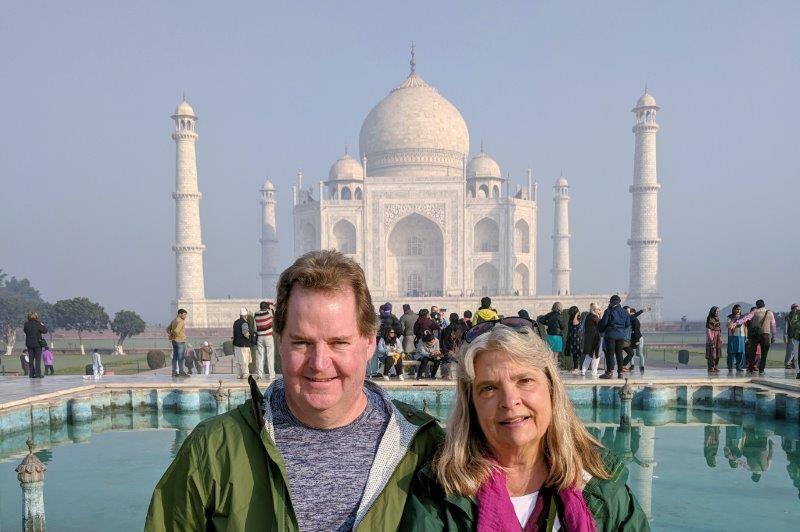 Mark and Susan at the Taj Mahal. Our guide did well with the cameras, thank heavens! Our selfie skills are severely lacking. No crowds at 8 AM so no lines for security. Speaking of security … every monument we went to had some sort of security. Our bags were at least checked. Regardless of the security, men and women go through separate lines all the time. 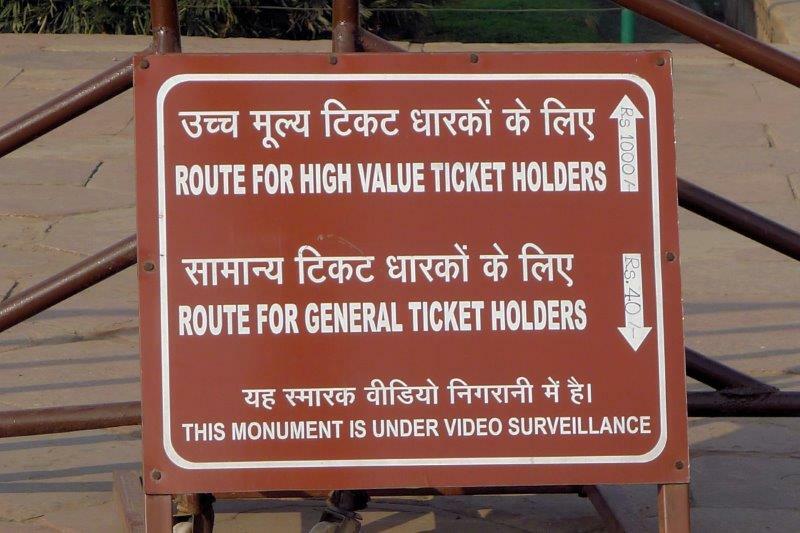 Since non-Indian visitors pay a much higher price for admission tickets, we also use separate admission lines. The non-Indian visitors get the faster lines thanks to paying 10-20 times the price that an Indian citizen pays. Different lines for “high value” ticket holders. Translation – foreigners who pay WAY higher admission prices! 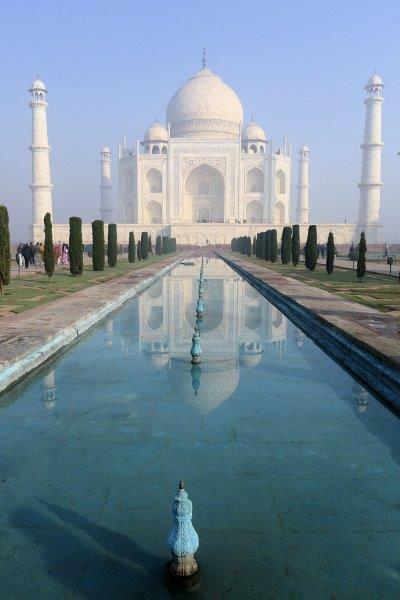 Taj reflected. If you look really carefully, the dome is a different color because it hasn’t been cleaned yet. The fountains at the Taj don’t turn on until about 9. This made for a nice reflection in the pools. The crowds hadn’t descended on the Taj yet, either. 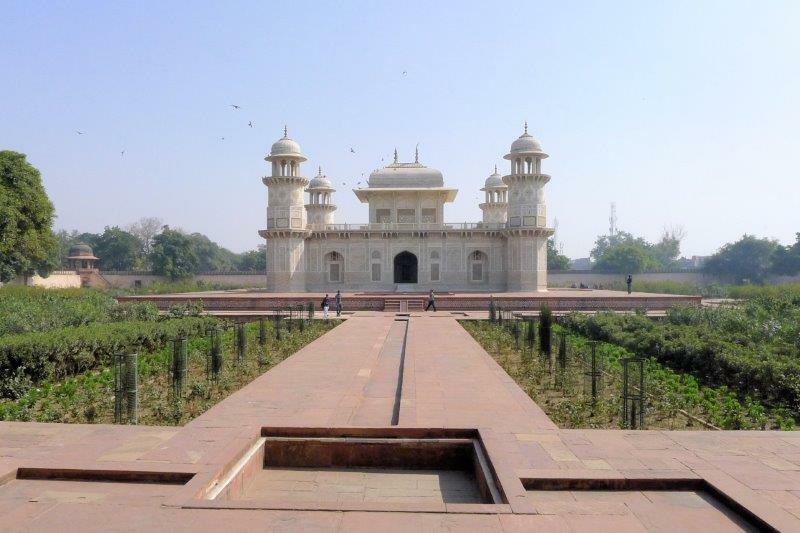 Tomb of I’timād-ud-Daulah is a Mughal mausoleum often regraded as a draft of the Taj Mahal. The Itamad uh Dualah, also known as the Baby Taj , is a smaller, delicate building on the river with very few visitors and a lovely western toilet! Somehow, an unwritten rule seemed to be that international visitors also were charged more for the toilets – 20 rupees versus 10 rupees. If the toilet was clean and western, I was happy!